Teaching a baby to fall asleep and stay asleep is a priority for many new parents; as you no doubt know from experience, sleep deprivation can impact every area of your life, including your work performance, your relationship with your partner or spouse, your overall mood and emotional health, and more. But chronic sleep deprivation can also impact your child’s health; over time, sleep deprivation can lead to a host of physical problems (including greater risks for obesity) as well as emotional and behavioral issues. FIND OUT ABOUT PERSONALIZED SLEEP PLANS HERE! Luckily, there are proven techniques that can really help babies and parents find a better night’s sleep – and these five tips will give you a great place to start! 1. Develop a Sleep Routine – Children thrive on routine and predictability. With proper nap and bedtime routines, a child will know what to expect and begin to welcome sleep as part of the daily schedule. A typical bedtime routine might last 20-30 minutes (possibly longer for spirited children) and include diaper and pajamas, a quiet game, breastfeeding/bottle/cup (for babies under 2), teeth brushing, potty (if applicable), reading, cuddling, and then lights out. A nap routine is similar to the bedtime routine, but usually shorter, about 10 minutes. 2. Schedule an Early Bedtime – An early bedtime is crucial to a good night’s sleep. When babies and young children are overtired, they may have more difficulty falling asleep and staying asleep and will often wake too early in the morning. While many parents think that keeping a child up later at night is best, it’s actually the early bedtime that will lead to a more restful sleep and a later waking in the morning. 3. Ensure Baby Takes Naps – The better a child naps during the day, the better she will sleep at night because she’s less likely to be overtired at bedtime. A good nap lasts at least one hour (for babies over 6 months old; shorter naps are normal for younger babies) and is in a quiet, sedentary location, versus in a stroller, swing or car, which is not nearly as restorative. If your baby is in daycare, parents may need to work with their daycare providers to establish routines and limits to enable the child to nap longer. 4. Avoid Sleep Associations – Babies, like all humans, have natural sleep cycles, which are periodic awakenings throughout the night. If a baby falls asleep using a soothing technique, like a pacifier, bottle, nursing, or rocking (which he cannot replicate on his own when he awakens between sleep cycles), he will likely cry out for you to help him back to sleep. So it’s important for you to put the baby into his bed awake, so that he falls asleep on his own and will be able to put himself back to sleep during the night. 5. Manage Night Feedings – Through the first nine months, it is considered normal for babies to eat one or two times overnight. Some stop much sooner on their own accord or with just a little nudge from mom. If a baby is eating more frequently than that or she is older than nine months, you may want to consider cutting back (or cutting out) feedings. All babies are different and experts disagree as to when overnight feeding should stop. You know your baby best and will be best able to determine whether she still needs to eat at night, but if your baby is still feeding multiple times per night after about 5 or 6 months of age, you are likely dealing with a feeding association. Remember, everyone’s situation is unique, and what works for one family may not work for yours. It takes courage and dedication to work through your baby’s sleep issues, but the time you spend will be well worth it. Without chronic sleep deprivation, you and your baby will no doubt be happier and healthier, and that is worth all the effort! 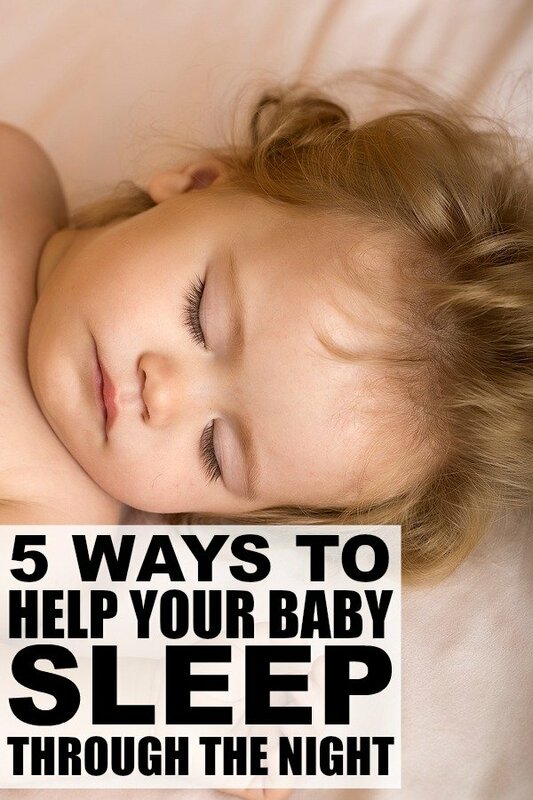 If you found these tips to help your baby sleep through the night helpful, please share them on Pinterest! And if you’re looking for more sleep advice, please follow our Sleeping Children board where we share all kinds of helpful tips and tricks! Nicole Johnson is the President of The Baby Sleep Site®, which was founded in 2008. The Baby Sleep Site is the internet's leading resource on baby and toddler sleep with over 1 million visitors each month. Nicole and her team offer professional, sound support that works. Maybe they can help you, too!